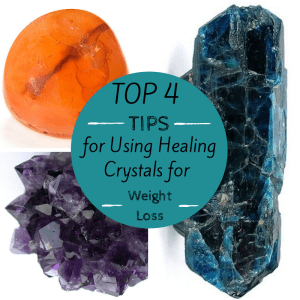 I am often asked which crystals for weight loss I recommend. My personal choice, and the stones that I find myself recommending over and over again to my clients, are Carnelian, Amethyst and Apatite. I have personally had great results with these crystals. I lost 20 pounds in just three months. The Apatite crystals (I recommend either Blue or Green Apatite) works to suppress or control the appetite. Apatite is also great for helping you to find and maintain your ideal body weight (or your most healthy body weight). Amethyst works well to help people to break bad habits or overcome addictions. This means it can also be useful for people who have issues with portion control or overeating. These issues can stem from emotional or mental reasons. Carnelian can increase feelings of hunger, but this is because it works to enhance the metabolism. For this reason, I would recommend starting out with the Apatite and Amethyst. Add the Carnelian into the mix later, after you have started to lose some weight. Ideally, when you’ve lost about 10% of your total goal. Using a combination of the Apatite with the Amethyst and Carnelian helps to manage weight loss on the physical, emotional, and mental levels. This is different to traditional weight loss techniques, which usually only focus on the physical. These stones help energetically, as well as with portion control, eating slowly and deliberately, and being conscious of the nourishment that you are taking into your body. Shifting the pattern in your energy field can help a lot with achieving your healthiest weight. However, making healthy lifestyle choices is equally as important. The crystals are useful, but it is still up to you to nourish your body with a good diet, to exercise regularly, and to speak with your physician about your weight loss goals. Carry the stones in your pockets (or set in jewelry) during the day. Then place them on your bedside table at night. This means that you can continue to absorb the healing energy while you are asleep. Before eating your meals, hold your stones for a few moments and intend that your body will receive all of the nutrition that it most needs at this time. Additionally, that it clears anything that is not needed. Place the stones on the table near your plate of food. This means the crystals can charge your meal with their energy as you eat. After you have finished eating, hold the stones over your belly (or over the area that you would most like to lose weight). Now visualize yourself as your ideal, healthy weight. I would also use clear quartz. It makes me feel like I am fulfilled & have no lack in all areas. It makes me feel safe & my body is perfect for me as long as I am doing all the right things. Rose quartz can remind you to be gentle to yourself. Green aventurine makes me feel like I need to be fresh & clean & to eat those foods. Those are all amazing tips Ginger! Thanks so much for sharing. I couldn’t agree more about the green Aventurine! Crystal blessings. Hi Louise, thank you for your comment. That is very interesting that Apatite increases your appetite! Perhaps you would be better off working with Carnelian & Amethyst instead. Crystal blessings to you! You’re welcome Amber, crystal blessings! But I highly recommend it!!!!! I’m still in shock. And the left leg is still in not good condition so I’m just trying again as an experiment and to take pictures of the results. If I could include one of the progress so far I would! That’s incredible Erica! Thanks so much for sharing! Hi Erica, I would like to ask you how you used the carnelian, meaning, is there words you say, like do you use affirmations, or do you hold or place the stone near an area of trouble? I am totally new to using stones for healing and aiding with certain conditions, so I’m not quite sure how to use the stone or stones. I made a necklace of just a few apatite beads and amythest beads. It really works. The stones lay just past my throat. Where do you recommend purchasing the crystals? My best friend has gotten into the healing crystals and stones that help with health. I never knew that it was possible to use these crystals for weight loss by placing them in your pockets. This is such an innovative way to approach weight loss and I think my best friend would be interested in learning more. Hi Alexandria! Thanks so much for your comment– we are so glad that you enjoyed the article! Just as a reminder– energy healing is not meant to replace conventional medicine, but rather to complement and enhance it. Information within our site and in this blog post is metaphysical in nature and is by no means medical. Energy Healing should only be used with the understanding that it is not an independent therapy, but one that is a part of a holistic healing approach. <3 Crystal blessings!